Ah, the majesty of hot-air-balloon travel. The freedom! The sights! The complete inability to steer! It's the perfect vehicle for those wanting to travel without the hassle of actually picking a destination. You just get in and see where the wind takes you. While it's quite possibly the most unpractical way to get anywhere (actually, see our last slide before coming to your own conclusion on that one), it was the forerunner to modern flight. 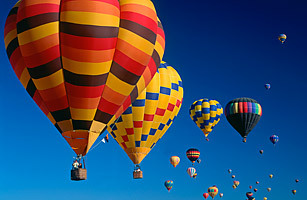 The invention of ballooning is credited to the French Montgolfier brothers, who climbed aboard the first untethered manned balloon in 1783 (witnessed by Louis XVI and Benjamin Franklin). The brothers supposedly took inspiration from watching one of their wives' skirts billowing in the kitchen from the heat of a charcoal burner being used to dry laundry, making this the only invention in history inspired by laundry. Relive the absurdity surrounding the "balloon boy" from late last year.